Someone get the bandages. Please! My cuticles are drying out so much because of winter. It's frightening how out of hand it's gotten. Just look at the awful state they were left in the other night! Kidding...obviously. Just another trick in the month of tricks and treats! 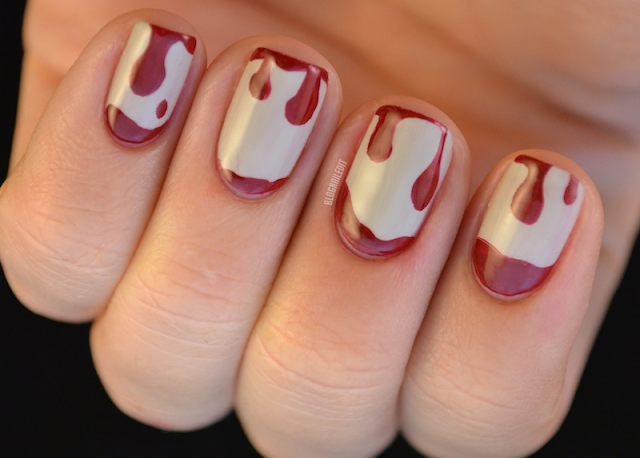 This gruesome manicure was done using Skull & Glossbones from OPI and Adventure Red-y from China Glaze. Tomorrow promises to hold something special as well...but will it be a trick or a treat? What do you think? Hope that something is a TREAT! Love the Skull & Glossbones shade from OPI! eeeeehw. This made me shudder only thinking about it! That is amazing. I like!